The University of Illinois at Chicago has received a five-year, $1 million grant through the Howard Hughes Medical Institute’s Inclusive Excellence Initiative. 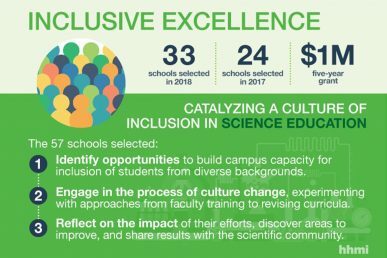 UIC is one of 33 colleges and universities to join 24 schools selected in 2017 for the institute’s initiative, which aims to improve the inclusion of students from diverse backgrounds in science education. Those students could include underrepresented ethnic minorities, first-generation college students, or working adults with families. Working with the Howard Hughes Medical Institute and the Association of American Colleges and Universities, UIC will conduct a pilot redesign of undergraduate requirements, programs and courses in the fields of science, technology, engineering and mathematics, or STEM, in addition to providing faculty development to encourage culturally responsive instruction. The five-year project will feature a professional development program designed to help UIC faculty grow a professional learning community of STEM educators on campus. This part of the proposal features training and support to increase the multicultural competencies of STEM faculty who teach introductory undergraduate courses. It will also be open to all instructors in STEM and other disciplines. UIC-based research units, the Center for Advancement of Teaching and Learning Communities and the Learning Sciences Research Institute, as well as external experts on diversity and inclusion, will contribute to the professional development program. The proposal also seeks to increase flexibility and success in early STEM undergraduate education through improved coordination of course scheduling, reformation of prerequisites, and introduction of upper-level corresponding courses. This work will be tested in three STEM departments — biological sciences, chemistry, and physics — within the College of Liberal Arts and Sciences. Overall, the research team will monitor student learning and intellectual, social and emotional development outcomes, as well as student and faculty perceptions of campus climate relative to issues of inclusiveness. “This initiative is about encouraging colleges and universities to change the way they do business — to become institutions with significantly greater capacity for inclusion of all students, especially those from nontraditional backgrounds,” said Erin O’Shea, president of the Howard Hughes Medical Institute. The UIC project team includes co-principal investigators Miquel Gonzalez-Meler, professor of biological sciences; Jim Pellegrino, distinguished professor of psychology and education and co-director of the Learning Sciences Research Institute; Mike Stieff, professor of chemistry and learning sciences; and Renee Taylor, professor of occupational therapy.